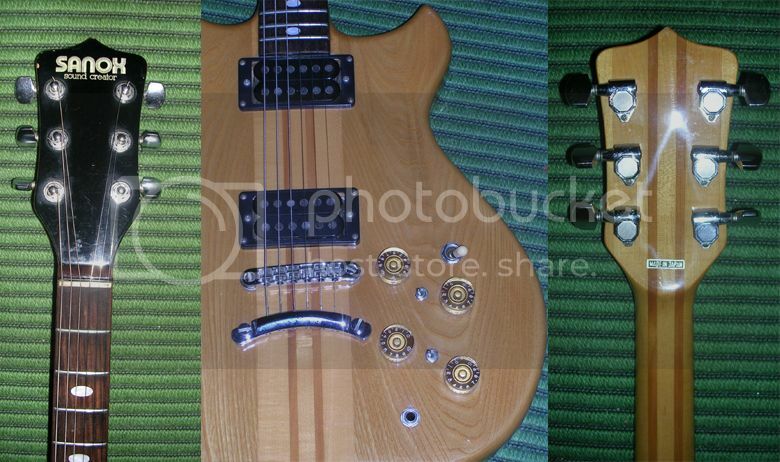 I was looking for some information on the Sanox guitar I own, and I found your site. Here are some pics from my Sanox, bought second-hand; must be around 30 years old. Payed 100 euro for it (Belgium). I was intrigued by the neck-through construction and I like the wooden look. It still plays well; electronics need a clean-up, one pot needs to be replaced I think. Unlike the obviously Strat-inspired Sanoxs (or should that be "Sanoxes"?) we have already featured on Guitarz, here we see a departure with a neck-through design that looks to be inspired by Alembic guitars; witness the point at the end of the body upon which the strap button is mounted, and also note the elipse-shaped fingerboard markers. 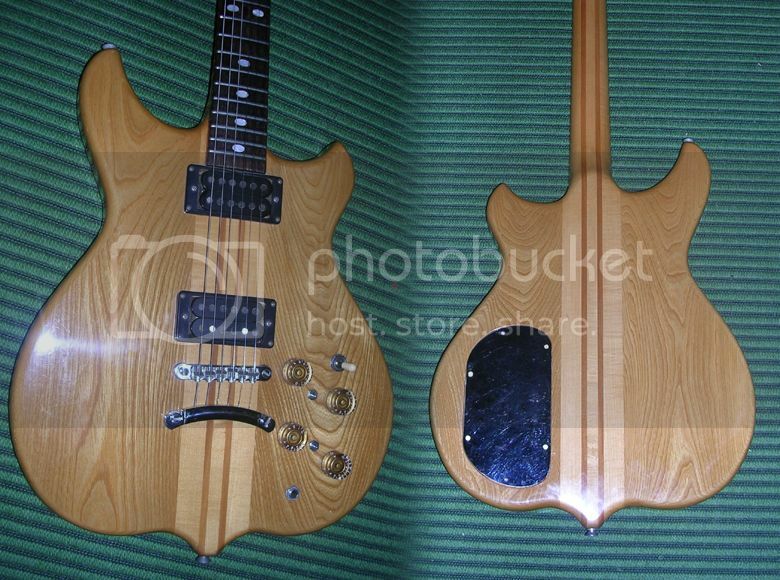 Whilst the neck-through styling would seem to suggest this guitar was built in the 1980s, I'm reserving judgement on this and think it could be as early as, say, 1976 because it is an Alembic copy and Alembic were the originators of multi-laminate neck-through guitars and basses way before the style became fashionable in the 1980s. I'm guessing that the mini-toggle switches located in the middle of the block of volume and tone controls are coil taps for each of the two humbuckers, which ought to make for a versatile selection of tones. I'd say that for €100, Stef, you got yourself a real bargain there. Thanks for showing us your guitar and allowing us to document another guitar from the almost obscure Sanox Sound Creator brand.